We have a select team of graphics and video specialist that do nothing but create content for the MAG Network. Depending on what your campaign goals are, you need rich media designed specifically for your type of promotion. So before you set your sights on launching a campaign, we’re here to help you get the best bang for your buck. That’s why we developed the MAG Media Factory. Whether you need media to post on Social Media, sending traffic to a website or an offer, the first thing that you need is attention grabbing content. Online competition is fierce, you have a dedicated team behind you when you work with us. 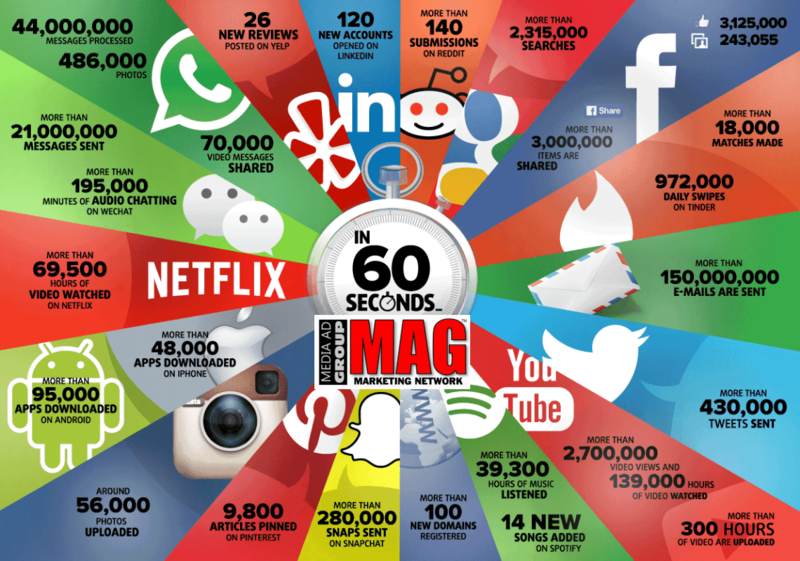 This is what happens every 60 seconds on the internet! If you want to get in the game, start with content that will get you noticed! First, Let’s Get You Some Engaging Content To Get Noticed! Start Grabbing Some Attention Right Now!